Some people of Bandung may be unfamiliar with Lake-Situ Cileunca, due to its location far and very narrow road to get there. If we just talk about Lake-Situ Cileunca and never visited is certainly it does not fit, because the natural scenery offered by Situ Cileunca very beautiful with green tea plantations Malabar and three mountain standing strong, namely the mountain Malabar, windu mountain, and the mountain wayang. Situ Cileunca located 45 KM south of Bandung and 185 KM from the city of Jakarta, Situ Cileunca at an altitude of 1550 Mtr above sea level and is surrounded by two Malabar tea plantations managed by PTPN VIII, Situ Cileunca located not far from the district Pangalengan, puddles of 180 this hectare village is flanked by two Village Wanasari and Village Pulosari. Historically, Situ Cileunca was a private area of a Dutch citizen named Kuhlan who had settled in Pangalengan. Within its construction, Situ Cileunca implemented in longer periods of time that for 7 years (1919-1926) with the stem, river flow Cileunca, forming a situ which eventually became a dam that is now named Dam Pulo. In the Dutch colonial era Situ Cileunca used as a source of electricity for the city of Bandung, in addition, water discharge is also used as a backup source of clean water for the city of Bandung, with a capacity of 9.89 million m3 of water. Situ Cileunca, Pangalengan, As one of the lakes which functioned as attractions in South of Bandung, a lot of visitors or tourists who come here to try to sense or enjoy the beauty and charm of Situ Cileunca, Bandung. So that not infrequently, according to the guard Situ Cileunca, visitors or tourists who’ve come here not just one time only, they in a different time and occasion coming back just because already fall in love, with the sensation of Situ Cileunca. – The Management of this place, providing Camping Ground area is very quite adequate, make Situ Cileunca as other camping grounds in southern of Bandung other than Ranch Upas. If in Ranca upas you get the sensation of camping in the middle of the beautiful forest conservation, then camping in Situ Cileunca you will get the sensation of how to enjoy nature at the edge of the cold lake in the evening. – Rafting – Benefits Situ Cileunca was not only used as a source of clean water and hydropower (hydropower) for Bandung residents, but where’s Rafting activity in Pangalengan, precisely in Situ Cileunca, using output water from the dam Cileunca(hydropower) where the water is pretty heavy, and of course your adrenaline challenge to conquer. – The water Attraction – If you come with your family here in the daytime, then you should try to reach the boats to get around the lake while looking at how the clear waters of the lake nearby touching it directly, feel the cool breeze from the cool hills that hit your face, make you healthy and of course, you will be able to see how the beauty surrounding plains and hills from center of the lake is certainly very remarkable. – The Strawberry Gardens, Just as tourist areas located in the highlands and cold air, so in Situ Cileunca Pangalengan tourist area, visitors will be able to easily get fresh strawberries and straight from the tree. To get to the location of the Strawberry Gardens, visitors must use the transportation to cross by boat – IDR 5000 rates/person. 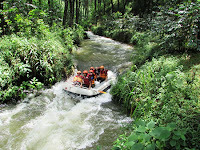 Entrance fee to Situ Cileunca, Pangalengan – IDR 2,500/person. The address Situ Cileunca, Pangalengan. Wanasari village – Pangalengan – Southern Bandung regency, West Java. To access Lake-Situ Cileunca pretty easy to find the location, because there is a bus that connects from Bandung to Pagalengan, with a travel time of about 2 – 2.5 hours. If you are using a private vehicle, from Bandung, the sequence like this: Bandung -> Katapang -> Banjaran -> Pangalengan. From Banjaran to Pangalengan location is approximately 35 KM. right at the T-intersection locations in Pangalengan, please take the direction to the right toward Garut (Cisewu), less than 5 Km further you will find a lake that is quite wide, with the edges covered with large trees, lush, green and shady. Try it,…And Happy Holiday All.